Posted on March 19, 2013	by Alice C.
Spring officially begins this week. I am so excited! Even though the weather is still in the 20s here in south Chicagoland, the tulips are starting to poke their heads up in the backyard. The Pick Your Own website is a detailed directory to U-Pick farms in the United States, Canada and beyond. The site even includes local crop calendars to tell you what’s currently in season. Just click on your state to get started. Enter your state or zipcode to start finding a farmers’ market near you. Many folks may still be updating their listings for 2013. 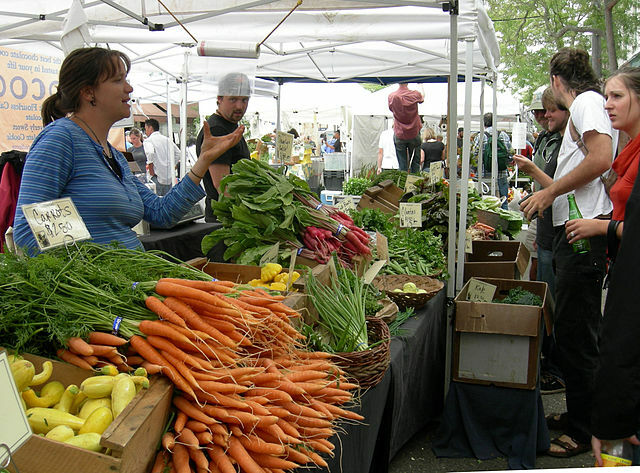 This farmers’ market search from the U.S. Department of Agriculture is quite comprehensive. It included many local markets that did not appear on the Local Harvest site above. Listings include the address of the market, types of products sold, schedule and contact information. I recommend this site. So, I’m going to be watching the tulips come up these next few weeks, and I’m also going to be keeping on eye on the above websites until I can hop on my bike and ride to the farmers’ market again! This entry was posted in Personal and tagged farmers market, food, personal. Bookmark the permalink.